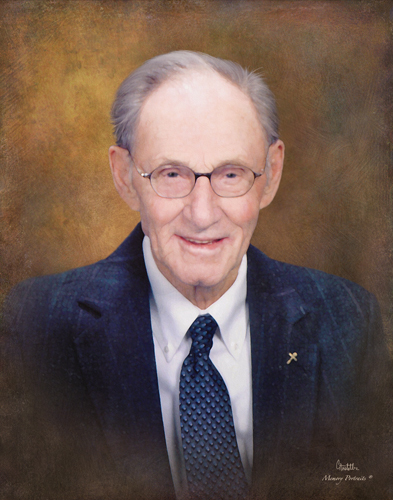 Joseph E. Seib of Haubstadt passed away on January 22, 2019 at North River Health Campus in Evansville IN. He was born to the late George and Anna (Schmitt) Seib on August 6, 1920 in St Wendel IN. Joe was a WWII Army Veteran and a member of the VFW. He was also a member of Sts. Peter and Paul Catholic Church where he was the oldest member. Besides his parents he is preceded in death my his wife, Margaret (Bittner) Seib in 2009, Children: Janie Lamey, Robert Seib and Raymond Seib, son-in-law, John Schneider, Brothers; Albert, John, Bill and Clem Seib and sisters Cecilia Adler and Mary Wilderman . He is survived by his children; Ruth Schnieder, Rochester IN, Joann (Terry) Maurer, Haubstadt, IN, Gene (Pat) Seib Evansville IN, Bernie (George) Caucci Newtown, PA, George (Jeanie) Seib Evansville IN, Paul (Mary Jo) Seib, Evansville IN., Nora (Steve) Elpers, Evansville IN, Son-in-Law, Terry Lamey, Haubstadt IN. Brother, Clarence Seib St. Wendel, IN and a special Companion, Ruth Hacker, Fort Branch IN. ; 20 Grandchildren and 42 Great Grandchildren. A Mass of Christian Burial will be held on January 26, 2019 at 10:00 AM at Sts Peter and Paul Catholic Church in Haubstadt IN with Celebrants Father Tony Ernst and Father Kenneth Betz officiating. Burial will be follow at St James Cemetery with military services conducted by the VFW #2714 and Haubstadt American Legion. Visitation will be on Friday January 25, 2019 from 2:00 PM to 7:00 PM at Stodghill Funeral Home with a rosary at 1:30 PM and again at the Church from 9:00 AM till service time. The family would like to express their thanks to Deaconess VNA Hospice and North River Health Campus for the special care of their father.